We received the products in this blog post at no charge in exchange for our review. All thoughts and opinions are our own. 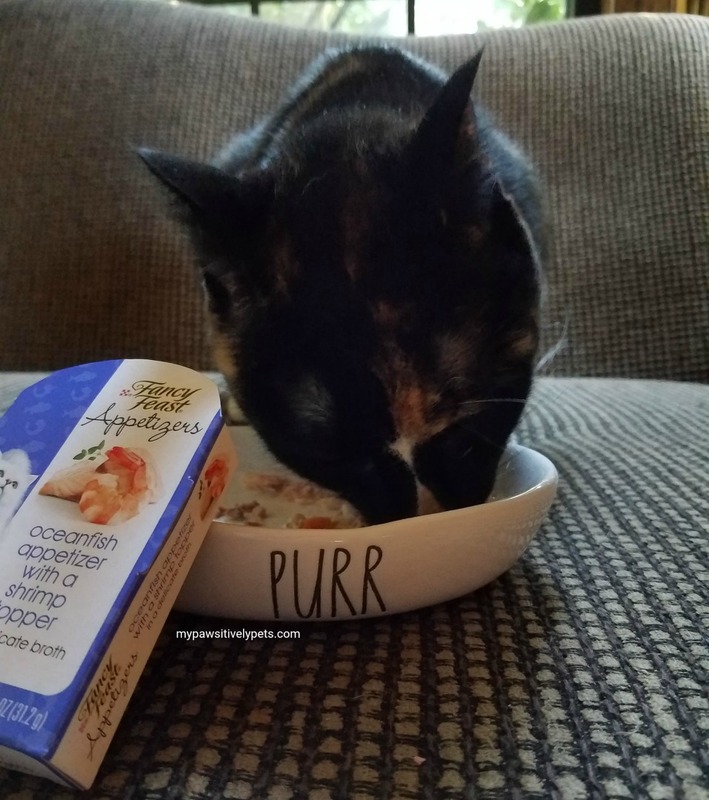 Are you looking for the purr-fect way to indulge your feline's taste buds? You can pamper your kitty with Purina Fancy Feast Appetizers! This month, our friends at Chewy.com sent over some of these delectable treats for Callie to try. 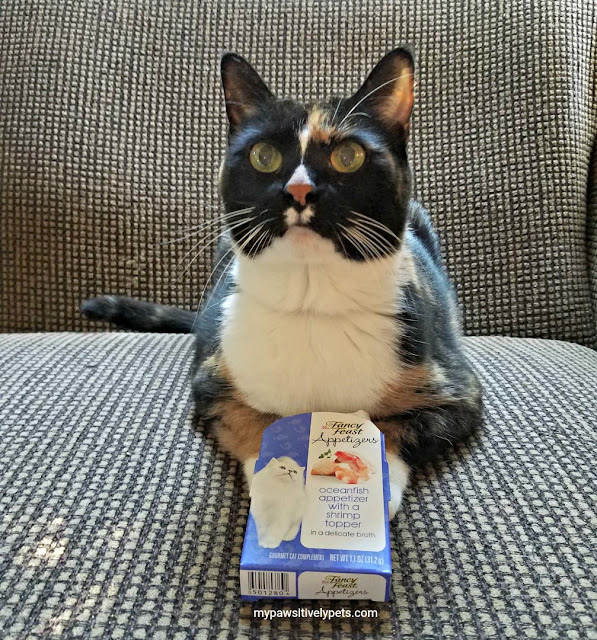 Callie has always loved her occasional Fancy Feast treats and we haven't tried these yet, so I thought we'd give them a go. There are five delicious flavors of Fancy Feast Appetizers for cats, but we decided to try the Oceanfish with a Shrimp Topper flavor. This flavor is made with real, flaked oceanfish and shrimp in a savory fish broth. Fancy Feast Appetizers are the purr-fect complement to your cat's complete and balanced diet. So what does Miss Callie think of her Fancy Feast Appetizers? She's familiar with other similar products from Fancy Feast and when she saw me ready to dish something up for her she got very excited. Once this tasty treat was in her bowl, she devoured the entire thing until her plate was licked completely clean! I'd say that Fancy Feast Appetizers are a big hit with her. If you're looking for a new and delicious way to treat your kitty, check out Fancy Feast Appetizers available at Chewy.com. They are affordable and Chewy.com even offers auto-ship so your kitty never runs out of their favorite snacks and food. Chewy.com ships out fast and offers free shipping on purchases of $49 and over. Be sure to check out Chewy.com on Facebook and Twitter. Are you a #ChewyInfluencer? Be sure to join the monthly Chewy Blog Hop below! Those make a good snack for when I am working all day at a cat show! We haven't tried these, but I bet our kitty would enjoy them. Callie, those do look tasty, for sure! Yum! We sent for a sample from Fancy Feast and we're still waiting.